Well it has been quite some time since I last wrote. My life has been quite hectic the last seven months or so, but it’s been an enjoyable chaos. Obviously, I’ve had to forego some of my typical posts, like Combine recaps, Football season recaps and Michigan spring practice reviews. Though without a spring game, it’s a little bit tough to evaluate anything that’s been going on over there. At any rate, I’ve got this post for you, I’ll have a draft recap and the winners and losers and then it’ll be back to radio silence. The draft recap likely will not be for 2-3 weeks after the NFL Draft, but that’ll give you guys some time to re-visit things. I would have had a whole post written up about the Matt Patricia hire, but there’s not really much to analyze…it’s a fantastic hire. I’m extremely encouraged and I think he’s going to do a great job. There will be some personnel changes and scheme changes, but it’s going to be a good season. Hopefully having a less conservative head coach will allow Jim Bob Cooter to let off the reigns and open up the play calling. I’m going to try to keep this as brief as possible while still giving you info, so let’s get after it. Looking towards the roster, there are some very obvious and glaring needs. Bob Quinn has done a great job drafting so far, so I trust that he is going to fill needs while taking the best player available and not reaching. Looking right here, the biggest needs right away are another interior offensive lineman, a defensive tackle, a defensive end, a tight end and a running back. I’m not very particular in what order they try to fill those needs in, but they need to be addressed. Thanks to Graham Glasgow’s versatility, they can either draft a guard and leave him at center, or draft a center and kick Graham back to guard. My preference is to leave him at center and add a guard like Isaiah Wynn or Will Hernandez in the first round. Those two maulers would do great things next to Taylor Decker and finally solidify the line for the run game and Matthew Stafford. With Haloti Ngata moving on, there is a major hole at defensive tackle. A’Shawn Robinson developed nicely last year and I like the Sylvester Williams signing, but they still need another DT early to add depth and preferably to play long-term. Williams is only on a one-year deal so he is by no means a permanent solution. At defensive end, Anthony Zettel was a bright spot and getting Kerry Hyder back after his injury will be nice. But with Ziggy Ansah being franchise tagged, they need another high-end pass rusher added to the mix. I’m still not completely convinced that the Lions will keep Ziggy past this season. He’s been wildly inconsistent and quite frequently gets a lot of sacks in one game to pad his stats. The Lions struggled mightily to get after quarterbacks last year and that is something that needs to be remedied to help out the secondary. Tight end was not a need until they decided to cut Eric Ebron. I’m on record saying I never wanted to draft him in the first place, but I definitely do not totally understand cutting him. Obviously, they were not able to trade him and decided just to move on, but I’m not sure why they did not want to use him for the last year of his deal and then let him walk. I’m guessing something behind the scenes happened because the press release announcing the cut was quite cold and Ebron has been nothing but a knob in the media since…not that I totally blame him or expected otherwise. Signing Luke Willson and Levine Toilolo gives you a good combo to provide a stop-gap without Ebron. They do not have to chase all over the board looking for a tight end, but it would be wise to get one in this draft…so long as his name is not Hayden Hurst. Running back is the final obvious need for me. Signing LeGarrette Blount gives you a nice bit of “thunder” to go with Theo Riddick, but again, he is not a long-term solution. If they could get a running back in to compliment Riddick and ease him into things that would be ideal. It wouldn’t be great for fantasy, but I think Blount, Riddick and a rookie could be a nice three-headed monster for the offense. I think the last need that is less pressing, but has come up in recent weeks, is linebacker. They have a good core, but it would not hurt them to add another linebacker to the mix to have a future starting group of Jarrad David, Jalen Reeves-Maybin and the player they drafted. Thanks to Walter Football, there is a compilation of players they’ve met with before the draft in some form or fashion. Does this list matter? Well for some teams it might not. But for Bob Quinn it is a huge indicator of players they could end up with. In his first draft, 6/10 of the Lions picks were on this list and last year it was 5/9. 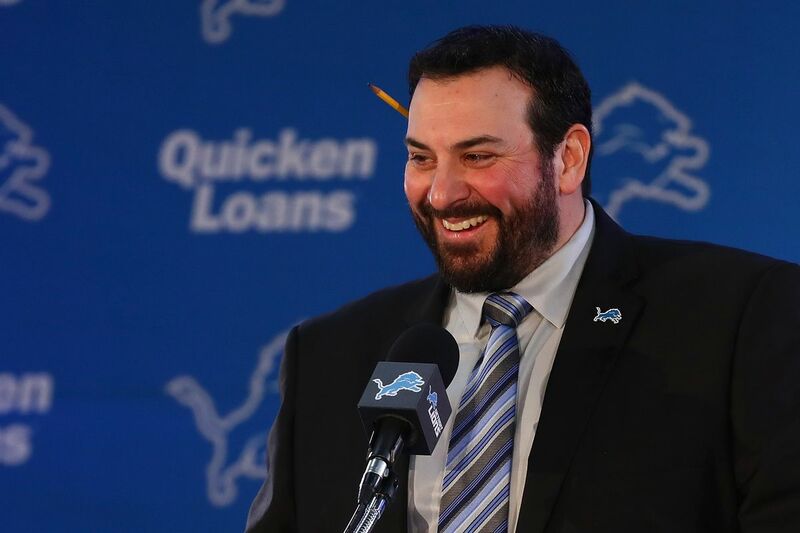 This year the Lions only have 6 picks, but Bob Quinn has made it known that they are looking for more picks and I would absolutely love them to pick up another two picks. 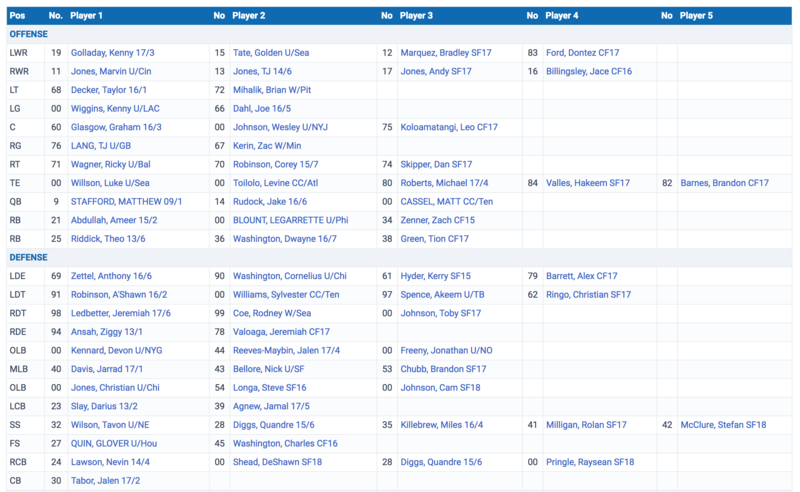 Now that you’ve gotten a nice quick little preview on the biggest holes, here is my ideal seven-round draft with potential alternate picks. This is a bit of an odd draft talent-wise. Last year was one of the deepest drafts in recent memory but this year is not the same. There are some positions that are absolutely loaded (QB, RB, Safety) and unfortunately, positions that Lions need are quite weak. TE and EDGE are extremely problematic and the Lions are going to have to target EDGE early. With TE being such a need, they may target it earlier than you would think, so just have your fingers crossed that they will not go for Hayden Hurst in Round 1 or 2 because he is 25 and not that athletic. With the amount of needs that they have, I can honestly say that as long as they do not draft a tight end or a running back in the first round that I’m going to be pretty okay with whomever they target. I do not love Marcus Davenport out of UTSA, but I would rather they draft him than Hurst or Derrius Guice in the first round. If I was calling the shots, I would say that interior offensive line, defensive line (DT and EDGE) and running back would be my primary targets in the draft. I would also make sure to draft a linebacker in the last three rounds to add some depth and then call it good and get ready for next season. Hopefully Bob Quinn will add a couple more picks and then the Lions can be primed to take the next step under Patricia. This entry was posted in NFL and tagged 2018 Detroit Lions Draft Preview, A'Shawn Robinson, Anthony Zettel, Austin Corbett, Bo Scarbrough, Bob Quinn, Damon Webb, Derrius Guice, Detroit Lions, Duke Ejiofor, Eric Ebron, Fred Warner, Graham Glasgow, Haloti Ngata, Isaiah Wynn, Jalen Reeves-Maybin, Jarrad Davis, Jim Bob Cooter, Josh Adams, Josh Sweat, Kerry Hyder, LeGarrette Blount, Levine Toilolo, Luke Willson, Mason Cole, Matt Patricia, Matthew Stafford, Maurice Hurst, Poona Ford, Rashaad Penny, RJ McIntosh, Ronald Jones, Skai Moore, Sylvester Williams, Taven Bryan, Taylor Decker, Theo Riddick, Troy Fumagalli, Vita Vea, Will Hernandez, Ziggy Ansah. Bookmark the permalink.